One of the most useful features of Arduino Yun is the ability to upload your sketches via network, directly from the IDE (as I explained in a previous tutorial). Arduino’s IDE uses the Bonjour protocol (running on port UDP 5353) to look for Yun boards on your network: this auto-discovery technique works fine in a local area network, but fails on the Internet. Today’s project allows to upload a new sketch using a protected web page, easily accessible also on the Internet. I developed a PHP application that performs the operations listed above; for security reasons the application is password-protected (using the same password you type to access your Yun via SSH or to upload sketches using the IDE). The server-side application is developed in PHP: you need to install some packages to run it; the installation can be performed using the WebGUI or a terminal as it follows. Finally, configure the uHttpd server as explained here. The files of the project are available in my Github’s repository. This is so cool! Great work! Is it possible to copy/padte the .hex path into the uploaded (instead of navigating to file) since this path changes erverytime… and we have to get this path from IDE window anyway? I found a strange behavior… sketchUploader loads and reboots Yun… but the code is not actually changes. I get errors like this.. when uploading via ethernet or with sketchUploader. Wifi and usb work just fine. Have you seen this before? that’s strange, it seems the “linux” part of the Yun can’t communicate with the atmega32u4… are you able to upload sketches using the Arduino IDE via wifi? I use 1.5.6-r2 IDE, and recently updated the firmware to the latest from Arduino. Wifi and usb upload work fine. I think sketchUploader worked fine at first (confusing now)… but sketchUploader and ethernet definitely don’t work now on multiple Yun modules. Still scratching my head. I really like your sketchUploader.. it should be a standard package that makes the Yun so much better! Is it possible for the Yun to fetch the upgrade from a remote website and then do the sketch update? This would avoid the need to access the Yun from a remote site when it is likely behind a firewall. Firstly, thanks for your work, the project is amazing and very useful for arduino. I have been done everything you say in this post and even tried the php example webpage with success, but once I tried with the sketchUploader webpage it appeared with a white background and a simple style. I have tried that webpage on my computer and even with the dreamweaver editor and it seems that it is a problem of the webpage directly. Have anyone tried to the las update of this project? I downloaded it from the official repository. Anyway, thanks a lot for your job luca!! Sorry, there’s an error in the last post. I wanted to say “I have done” in spite of “I have been done”. Hi Gabriel… could it be that you didn’t install PHP (or one of its required modules) on the Yun? Anyway, did you notice that the latest official images include a “built-in” sketch upload feature? I get the sketchuploader page but why does it just sit there after I enter arduino for the password? very strange, did you install PHP and all the requires packages? Anyway, the new version of Linino do include a “builtin” function to upload sketches, did you try it? yes all packages confirmed installed. Can I install the latest linino from 5 days ago or do I need the arduino one for my yun? thank you!! 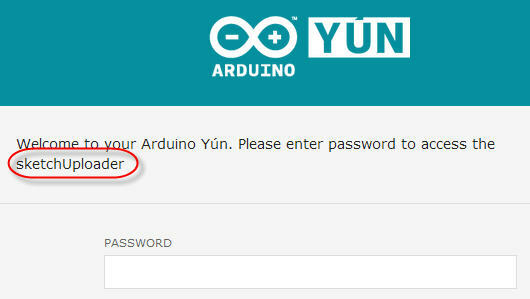 and I type in arduino for the password, click on log in but nothing happens, what may I be missing? thx again for helping!